"Transport Tycoon (TT) and Transport Tycoon Deluxe (TTD) are computer games developed by Chris Sawyer and published by MicroProse in 1994 (TT), and 1995 (TTD). They are business simulation games, presented in an isometric view in 2D with graphics by Simon Foster, in which the player is in control of a transport company, and can compete against rival companies to make as much profit as possible by transporting passengers and various goods by road, rail, sea or by air. The Deluxe version is an expanded and improved version of the original game. The game begins in 1930 (1950 in TTD), and ends in 2050. The player starts out by borrowing money to finance construction of transport facilities, and is charged interest until the loan is repaid. As the user plays the game and earns revenues, they have the choice of expanding service along existing routes, or expanding their transportation network. The game features a progression of technology: in any particular year of the game generally only contemporary types of technology are available. For example, railroad signals which allow more than one train to use a section of track are initially semaphores. Later they are replaced by red and green traffic-light signals. Similarly, in the beginning there are only steam engines, but later diesel and electric engines are introduced. In the game year 1999, monorails become available. These require a separate track system from railroads. If the player remains in business until 2050, the game announces that they have won, allows them to post their name on the "hall of fame" and then continues. At this point, the year stays 2050 and never goes any higher, although the game can continue indefinitely. Playing the entire 120-year campaign takes about 40 hours. The game allows the player to save at any time, and multiple saves of a particular game at any point are possible. The player earns revenue by picking up resources or passengers at a certain station, and delivering them to another station where there is a demand for them. Demand is determined by the area which surrounds the station; for example stations close to towns will demand passengers. The revenues will depend on the delivery time, distance, and quantity delivered. The influence of these factors on revenue varies according to the type of goods being delivered. For example, mail will rapidly fall in value, meaning that it can only be delivered profitably over short distances, or over long distances very fast. On the other hand coal loses value very slowly, so it can be transported in bulk over long distances whilst remaining profitable. The game was initially published by MicroProse. It can still be found for purchase as a budget title, but may not be compatible with modern operating systems. Transport Tycoon works with Windows 95, and can be run on other OS's from DOSBox). A fan-made game engine recreation OpenTTD is also available. After the success of Transport Tycoon Deluxe, Chris Sawyer turned his attention towards a sequel, but during development he changed his mind and produced RollerCoaster Tycoon, which turned out to be a runaway hit. After RollerCoaster Tycoon 2 was done, work on the third version was left to another development team, and Sawyer returned to work on his Transport Tycoon sequel, Chris Sawyer's Locomotion. It was released in September 2004 and was described by Sawyer as the "spiritual successor to Transport Tycoon", but received poor reviews and was not a commercial success. Despite this there is an active Chris Sawyer's Locomotion community who continue to produce modifications. 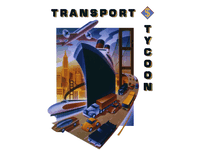 The music in Transport Tycoon was originally composed by John Broomhall, from 1994 to 1995. [clarification needed] It features old-style blues and jazz tunes including parts of Herbie Hancock's Cantaloupe Island. The music is presented in MIDI, and stored with the file extension ".gm". Several development teams are currently working to improve Transport Tycoon. TTDPatch provides gameplay enhancements and numerous bugfixes to TTD by patching the original binary. OpenTTD is an open source complete recreation of Transport Tycoon Deluxe, achieved by reverse engineering the original game, and delivers many bug fixes and general enhancements to the game, like making it possible to run TTD on multiple platforms, including Mac, Linux and PSP. While both games allow new graphic sets for vehicles and terrain to be used, at present, TTDPatch still requires the original TTD graphics, sounds, binary and music files to run. OpenTTD does not need any of the TTD files to run as it has free graphics and sounds, however it can still use the original TTD graphics and sounds. Source: Wikipedia, "Transport_tycoon," available under the CC-BY-SA License.